Cody loves Gremlin, the monster figurine her brother, Wyatt, passed onto her a few years ago. When her best friend, Pearl, proposes a trade - Cody's Gremlin in exchange for Pearl's Arctic Fox - Cody goes along with it, but regrets it almost immediately. 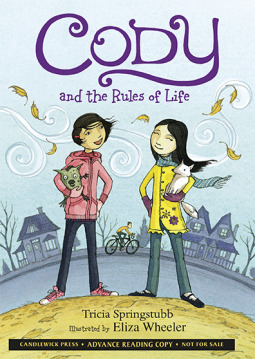 Though Cody is pleased that Pearl thinks of her as "trusty" enough to care for one of her prized possessions, Cody misses having Gremlin to confide in, especially when her brother's brand-new, hard-earned Cobra bicycle is stolen. Unable to stand it any longer, and afraid to tell Pearl how she feels, Cody steals Gremlin out of Pearl's backpack during a field trip and then allows Pearl to believe he has been lost. Before she can feel better, however, Cody will realize that she must be honest with Pearl, or she will be just as bad as the thief that took Wyatt's bike. This book, like the others before it, demonstrates Springstubb's understanding of the significance of small events in the life of a child. Negotiating trades and bargains with friends is something most kids must learn how to do at some point during the early elementary years, and Cody's experience provides a great blueprint, both for how to handle the situation poorly, and how to navigate handling it properly. The tempting gong on Cody's teacher's desk, and the fact that Cody has to try so hard not to touch it. The fact that Cody's teacher mistakenly assumes the Cobra is an animal, not a bicycle. Wyatt's teenager-esque dialogue that reveals his age and attitude without modeling disrespecful or inappropriate behavior. The fact that Cody accidentally (and secretly) scratches Wyatt's bike, a clue which later helps him identify it. Cody's concerns over dripping pizza sauce in Pearl's seemingly immaculate house. There are also several wonderfully quotable lines in the book. I especially liked Cody's observation, "If you enjoy rules that make no sense at all, go on a field trip." and her understanding that [C]onscience must be deep-down. Like a backbone. Conscience must be a vertebrate." Families looking for books with a clear sense of right and wrong and a believably flawed but overall good-hearted character need look no further than the Cody series. I say this every time I review one of her books, but Springstubb is the one of the best writers of new realistic fiction titles for kids, and I make it a point to read everything she publishes. You and your kids should, too.